While the birth, rise, and fall of Liberty Magazine does not perfectly coincide with the timeline of the history of its various publishers, it is close. Liberty Magazine, a project of publishing cousins Col. Robert Rutherford McCormick of the Chicago Tribune and Capt. Joseph Medill Patterson of the New York Daily News, first hit the newsstands in 1924 intending to make it’s dent with what TIME Magazine referred to as the “more jazz-loving level of the public” than what the Saturday Evening Post targeted. Liberty was originally edited by Patterson in New York and published out of Chicago. Under Patterson and McCormick Liberty Magazine was constantly in the red though expenditures of as much as $14,000,000 did manage to push circulation as high as some 2.7 million readers in 1927. Still, the magazine did not make Patterson and McCormick money, in fact it has been reported that Liberty lost the cousins $12,000,000 over their seven years of ownership, and thus it was sold to Bernarr Macfadden in 1931. TIME Magazine, reporting at the time of the sale in their April 13, 1931 issue, commented that Macfadden’s empire of thirteen publications had a reported combined circulation of 56,000,000 copies annually when he purchased Liberty. Under Macfadden Liberty Magazine is always noted for it’s initially strong support of Franklin Delano Roosevelt in the 1932 elections. Liberty published seventeen articles about FDR in 1932 alone. Macfadden personal political beliefs would soon align him and his publications against Roosevelt. By 1936 he was even emerging as a potential Republican Party candidate himself. Liberty Magazine reached its heights under Macfadden and editor Fulton Oursler, who would later edit Reader’s Digest. Several issues from 1935 are profiled below and are from this sucessful period when the magazine was part of Macfadden Publications. The controversial Bernarr Macfadden, whose name can usually be found preceded by the word eccentric as though it were a title, soon found himself accused of mismanaging Macfadden Publications funds, which he did in fact disperse throughout several of his other unrelated activities. When minority stockholders sued him in 1940 Macfadden would withdraw himself from the company which was eventually taken over by John Cuneo and Kimberly-Clark Paper Company in 1941. Also, in 1941 the new management would find that many of Macfadden’s publications had falsified circulation numbers in order to increase advertising revenue. Liberty had bumped its numbers up by over 20,000 copies. Even though the new publishers made good on these past indiscretions advertising revenue would never fully recover and the scandal led to thinner issues of Liberty with fewer ads being printed on a cheaper grade of paper. When the Saturday Evening Post increased their cover price from five cents to ten cents in 1942, Liberty Magazine followed suit and found their sales drop in huge numbers. Newsstand sales sunk by a third of their original total and ad revenue was cut in half dropping to just $155,000 by July 1942. In 1944 Liberty Magazine was turned over to Paul Hunter, who is credited with rescuing Screenland Magazine for John Cuneo back in 1932. Throughout the 1940’s several new owners took control of Liberty but nobody could resuscitate it. The final issue of the once popular Liberty Magazine was dated July 1950. During it’s heyday Liberty Magazine was noted for outstanding cover illustrations by Leslie Thrasher and, as you can see during the period I cover below, quite often used James Montgomery Flagg’s work to accompany fiction found inside the magazine. They published serialized fiction from some of the best writers of the time including, Erle Stanley Gardner, Dashiell Hammett, and Edgar Rice Burroughs plus short stories from popular writers noted below such as Kathleen Norris, Achmed Abdullah and Max Brand. They carried articles about Hollywood by Adela Rogers St. John and are famous for publishing the first important article about Alcoholics Anonymous, which can be read in its entirety elsewhere on other sites. Perhaps the most famous feature inside of Liberty Magazine were the times allotted to each article and story, an estimate of how long it would take the reader to digest each particular entry. The idea seems somewhat nonsensical, but I could see it being appreciated if you had a copy on your lap when you were pressed for time. And certainly the idea was original. Higher grade issues of Liberty Magazine from the 1930’s can be found for sale online for $15-$20, though higher if there is content inside or cover art which distinguishes it from the unremarkable issue. With a little wear to the covers and spine you can usually purchase the same issues for about $8-$12. All of the Liberty Magazine issues that I list below were initially offered at auction with minimum bids ranging from $4.99-$8.99 depending on the condition. 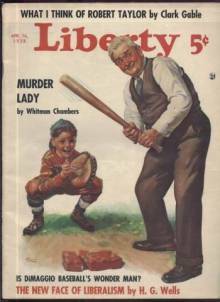 While the issues that follow do not comprise a complete consecutive run they do include eleven of the sixteen weekly issues of Liberty Magazine published with cover dates ranging from January 5, 1935 through April 20, 1935. I think the covers and listing of the contents of these issues serve to give us a better idea of both the world, especially the United States, in early 1935, as well as what the faithful reader of Liberty Magazine could come to expect each week when they paid their nickel at the newsstand. Peterson, Theodore. Magazines in the Twentieth Century . Urbana: The University of Illinois Press, 1956.